Making pizza is a great weekend food project. You can make the dough very quickly and let it rise and rest in the fridge while you run errands and do other weekend activities. When you’re ready for pizza, rolling out the dough, adding toppings, and baking takes no time at all. And if you double the dough recipe, you can keep the dough in the refrigerator for several days or it will keep in the freezer for a couple of months. 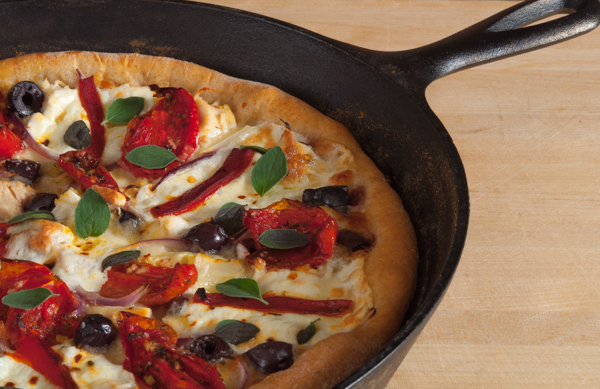 Pizza dough provides a blank canvas for whatever toppings you love. The possibilities are limitless! I think general consensus says that pizza is junk food, but I beg to differ. If you use whole wheat flour in the dough and make wise topping choices, pizza can be an incredibly healthy meal. Some of my favorites pizza toppings are pear and blue cheese, chicken and spinach with a white garlic sauce, and Greek ingredients including black olives, artichokes, feta, and oregano which is what I made for this post. Aside from the dough, there are no specifics in making pizza. I tend toward generous amounts of toppings which mostly requires a fork to eat a slice. Jim likes just some sauce and cheese. Since I’m doing the cooking, our pizza usually ends up my way! Mostly I make pizza on a pizza stone, but I thought I’d mix things up this week and make pizza in my 12 inch iron skillet. As I’ve talked about in another post, cast iron, assuming it is well seasoned, is the best non-stick cookware I’ve ever used. It worked like a champ and resulted what was more of a deep dish pizza. 1. Whisk together water, yeast, and sugar in a small bowl. Let sit for 4-5 minutes until a thin layer of foam appears on top of the liquid. 2. Put flour, salt, and cornmeal in the bowl of an electric mixer. Attach dough hook. Turn mixer on low to mix dry ingredients. 3. Turn off mixer and add yeast liquid and olive oil to dry ingredients. Turn mixer on low and mix until the dough comes together. Scrape sides of bowl as necessary. Turn mixer up to medium high speed and knead for 2 minutes. 4. Remove dough from mixer bowl. In another bowl, add 1 tsp olive oil and spread around bowl. Place dough in bowl and turn 2 or 3 times to cover dough with oil. This prevent a crust forming while the dough rises. 5. Cover bowl with a damp dish towel and place in a warm dry place. Let dough rise for 1 1/2 to 2 hours. 6. Punch dough down and place covered bowl in the refrigerator for 1 hour. *If making dough by hand, mix ingredients in a bowl with a large spoon until blended. Place dough ball on a flat and floured surface. Knead the dough by pressing into the dough with the palm of your hand. Fold dough over and make a quarter turn and repeat. Continue kneading for 8 minutes. 2. Roll dough out to a 12 inch diameter circle. 3. Place dough in a well seasoned 12 inch iron skillet. 4. Spread grated mozzarella cheese over the dough. 5. Spread onion, artichokes, chicken, olives, and feta over cheese. 6. Sprinkle dried oregano and salt over pizza. Add red pepper flakes to taste. 7. Top pizza with tomatoes and slices of fresh mozzarella. Drizzle with olive oil. 8. Turn a burner on the cook top to high. Place the skillet on the burner for 2 minutes. This starts the process of cooking the dough. 9. Place skillet in oven and bake for 15 minutes or until the crust is browning and the cheese is melted. 10. If you like the cheese to brown a bit, turn the oven mode to broil and cook for an addition 2 or 3 minutes. Watch very carefully if you take this step to not overbrown. 11. Garnish pizza with fresh oregano leaves. I never thought to cook pizza in a skillet! Great idea! Do you think it would work in a stainless steel pan? I don’t own a cast iron one. I know, I know…I really need to get one someday! lol! Thanks for the comment. I haven’t tried cooking pizza in a stainless steel pan. If you try it, I would spray the pan with cooking spray first. I would probably also skip the cooktop step. I would highly recommend investing in a cast iron skillet, though. Lodge makes great cast iron and they’re very moderately priced. You can find them most anywhere. Pizza is an awesome “go to” food. Just like you wrote, it can be anything you want it to be. I think a good homemade pizza cannot be beat-paired up with a good glass of wine, and it rocks.